Buildings account for an approximate range between one third and one half of greenhouse gas production in cities around the world, and the role design plays in mitigating built environment impacts is critical. There is an urgent need to improve energy efficiency and integrate renewable sources, while enhancing the lives of individuals and communities that consume, and in some cases, produce energy. This focus area, explores various performance measures linked to natural lighting, as well as general building energy investigations. This project will develop a low-cost, high-accuracy sensor platform that accurately detects human presence inside buildings to dramatically reduce energy use in residential settings. Senem Velipasalar (PI), Pramod Varshney (Co-PI), Can Isik (Co-PI), Sek Chai (Co-PI) and Tarek Rakha (co-PI). community of Austin, Texas, to create knowledge and tools to develop a Community Energy program that will serve as a model for other communities across the U.S. This study focuses on measuring the non-visual effects of daylighting controlled by electrochromic glazing on cognitive performance in the workplace. Tarek Rakha (PI), Mariana Figueiro (Co-PI) and Michael Kalish (Co-PI) and Emily Greer. Rensselaer Polytechnic Institute (RPI), Lighting Research Center (LRC) and Syracuse University, College of Arts and Sciences, Department of Psychology (PSY). 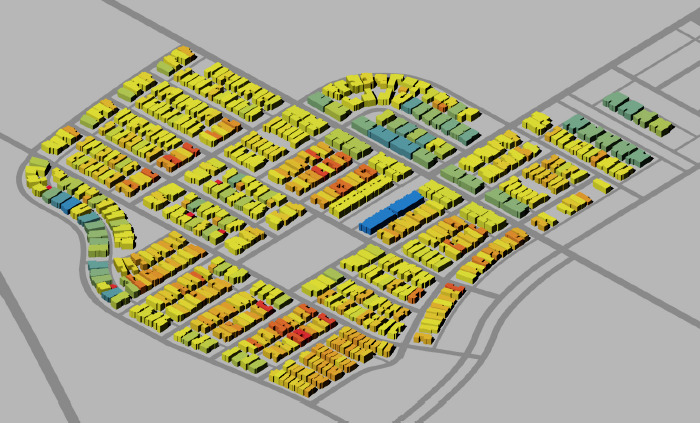 A new generation of urban building energy models (UBEMs) are currently being developed to estimate neighborhood-scale hourly energy demand loads. The objectives of this research are to visualize relationships between energy-flow subjects that are not yet integrated within existing UBEMs. Bess Krietemeyer (PI), Tarek Rakha (Co-PI), Jason Dedrick (Co-PI), Rutuja Ganoo, Previously: Beilei Ren and Sarah Ritchey. Syracuse Center of Excellence (CoE). Policies/incentives and political map chart for LEED residential market share in the US. This project is a thorough investigation of various LEED certification levels for residential buildings across the nation and across scales, with a preliminary meta analysis followed by granular building-by-building investigation. Tarek Rakha (PI), Tom Lumpkin (Co-PI), Todd Moss (Co-PI), Derek Shin and Colin Hoover. US Green Building Council (USGBC). Sustainable Enterprise Partnership (SEP), Whitman School of Management.